One of Cleopatra’s favorite rejuvenating secrets was to regularly slip into a bath of sour goat’s milk. While this Egyptian beautifying practice may not be particularly appealing (or practical) to the 21st century woman, there is good reason to believe that Cleopatra was getting the right advice from her Egyptian beauty advisor. Sour milk contains lactic acid. Lactic acid is an alpha hydroxy acid, slightly weaker than glycolic acid, which is regularly used in superficial chemical peels today. Perhaps Cleopatra was the first woman in history to popularize the skin regenerating benefits of exfoliation. If we fast-forward to modern times, the popularity of chemical peels and exfoliation techniques have exploded in popularity over the past two decades. Skin care professionals will usually incorporate some kind of exfoliation process into their basic facial treatments. It may be in the form of a light enzyme peel or mask. It may also take the form of more aggressive exfoliation treatments such as alpha hyrdoxy acids (AHA) peels, retinoids, microdermabrasion or even laser resurfacing. All these approaches are using variations on a theme of exfoliation. Initiating a superficial injury and removing the outer most layers of the skin will speed up cell turnover rate. This causes new collagen to be produced as a part of the body’s natural healing response. This result produces a plumping and tightening effect on the skin, softening of the appearance of fine lines and wrinkles, an improvement in the appearance of scars and an evening out of pigment issues. This has been considered the gospel for skin rejuvenation for almost 20 years. After all, if it was good enough for Cleopatra, then it must be good enough for us, right? Well, not exactly. More advanced skin research has revealed that there is more to this story. It now appears that regularly exfoliating the epidermis with acidic peels, microdermabrasion, lasers, or any other type of aggressive exfoliating methods may actually have the opposite effect of what was intended. If not done properly, such techniques may actually have the opposite effect and actually contribute to aging the skin. The purpose for chemical peeling and exfoliation is to generate new skin cells. This occurs by first destroying the outer damaged layers of the skin to remove old, dry, dead skin cells. This irritation results in inflammation which then supposedly induces new collagen production. Any injury or skin procedure (including exfoliating scrubs, chemical peels, laser resurfacing, and microdermabrasion), which removes the stratum corneum, the first layer of your skin causes micro-tears. This will, in turn, compromise the integrity of the natural protective barrier. Without an intact skin barrier, the skin may be more vulnerable to infection from bacteria, viruses and molds. Whenever there is a breach to the skin’s natural barrier function, the skin is at risk. Various conditions can impair the protective barrier such as severe dry and scaly skin; chapping of the hands from abrasive detergents or irritants; increased inflammatory factors associated with skin diseases such as acne, psoriasis and eczema; and sunburn, windburn or minor skin abrasions. In order to achieve optimal results from any type of exfoliation treatment, the skin must always be protected. Facilitating the healing and repair of the skin’s barrier function, calming inflammation and guarding against any sort of infection are all necessary for lasting skin rejuvenation. The Silver Solution Dating back thousands of years, there was one healing approach that had been widely used in Egyptian, Greek, Roman, Phoenician, Macedonian and Chinese civilizations. This powerful healing medicine was based upon the use of silver. Hippocrates, the “father of medicine,” wrote in his medical texts 2500 years ago that silver had beneficial healing and anti-disease properties. He praised silver for its tissue repair and wound healing abilities. Silver not only bestows powerful anti-microbial effects it is also nature’s powerful antibiotic, eliminating bacterial infections without initiating resistance. In addition it is proven to kill virtually all forms of viruses, fungi, and molds without any side effects. Thanks to an advanced 21st century technology, a more potent form of silver is now available in the form of a patented nano-silver technology by American Biotech Labs (U.S. Patent 7,135,195). This new form of silver is called Silver Sol Technology™. Traditional silver products, such as colloidal forms, work by chemical action, requiring direct contact with microbes to have any positive effect. Silver Sol Technology works by multi-modes of action. One such mode is by a catalytic action, rather than by a chemical action. This catalytic conversion allows the Silver Sol to first destroy pathogens and then to instantaneously recharge and “kill” again and again — like a rapid-fire machine gun, which make this nano-silver form more effective than other forms of silver. Silver Sol Technology is available both as a colorless, odorless, tasteless liquid and as a gel, called ASAP gel. Both forms can safely be used orally and topically. These nanosilver products are truly impressive. First of all, they have a broad-spectrum antimicrobial action. They effectively kill all pathogenic bacteria they come in contact, even the deadly Methicillin-resistant Staphylococcus aureus (MRSA), while leaving beneficial bacteria unscathed. Silver Sol has the ability to inactivate all kinds of viruses at the DNA/RNA level, thus preventing viral replication. It wields the same powerful anti-pathogenic ability with fungus and molds. The good news is that it does not interact with pharmaceuticals In fact, has been found to work synergistically with many medications. Just how effective is Silver Sol? Research shows that it will kill all forms of pathogens (including fungus and mold) within minutes. Silver Sol exhibits an extraordinary ability to eliminate bacteria, viruses, molds and fungi as well as enhance the immune system and provide rapid wound healing from infections and burns. As our modern world becomes more antibiotic resistant, the Silver Sol products are the safest and most effective solutions to help combat all kinds of pathogens that are found within our bodies and in the environment. There is now one more important use for the Silver Sol products. By integrating them into skin care treatments, they profoundly help to protect and repair the skin. Silver Sol gel and liquid have a unique mechanism of action that promotes skin healing by preventing infection, calming inflammation, and promoting stem cell release and activation. 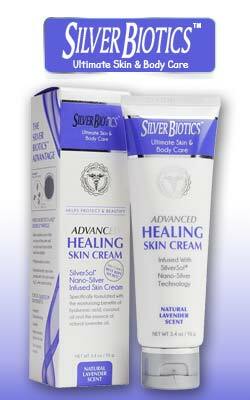 It will help to heal any abrasion or micro-tears to the skin. Another really big plus for using ASAP gel is its ability to reduce scarring! Because it is so effective in killing all pathogens, the skin is able to quickly heal and with minimal scarring. When it comes to skin rejuvenation, Mary Schook, makeup artist-turned-skincare sensation, of M.S. Apothecary in New York City is a renowned beauty expert. Mary is always on the lookout for the best natural products for skin rejuvenation. As an aesthetician, she has been concerned about the risks associated with exfoliation techniques, especially from infection and inflammation due to barrier disruption. Since discovering the Silver Sol products, she found the solution she was looking for. The Silver Sol liquid and gel have become an integral part of her skin care treatments. She always uses the ASAP gel as a precursor to any treatment she may be doing where she is compromising the skin’s barrier protection. The gel is also her secret weapon to calm redness from inflammation. She is adamant the ASAP gel should be used before and after all treatments. In fact she always gives a tube of the gel to every client as they leave her salon. Mary is a big fan of the Silver Sol products because they offer a myriad of ways for enhancing her treatments. “It is my first-line of defense for both practitioner and client from exposure to viruses and bacteria. I also use the gel as hand sanitizer, which kills all bacteria for up to four hours. I also use the gel before and after all treatments. Since using the gel, my patients have never had any skin irritation or breakouts. It is so much more effective and safe than any other product on the market. I can’t do without the ASAP gel. It’s really the only product that I have ever come across that does everything: protects me and my patients from any exposure to bacteria or viruses in a session and does such a fantastic job of protecting the skin, calming inflammation and even helping to heal breakouts and acne. The Silver Sol Technology provides an extraordinary ability to eliminate the risk of infection from bacteria, viruses, molds, and yeast plus enhance the immune system. Their long list of benefits is truly impressive: they provide rapid wound healing, reduce inflammation, and prevent scarring. It is recognized as one of the safest and most effective solutions for skin health and skin rejuvenation. The Silver Sol gel and liquid can be used for a myriad of skin conditions. Acne — Take two teaspoons of Silver Sol liquid twice a day. ASAP gel should also be applied topically twice a day. A reduction in the size of the acne breakouts can occur within 24 hours. Total improvement of the skins should take about four weeks — the amount of time necessary for new skin to grow from the bottom to the top layer. Age Spots — Taking two teaspoons of the Silver Sol liquid twice daily on a regular basis will help support the liver and also improve liver enzyme production. Apply ASAP gel on age spots two to four times a day. Burns and Sunburn — Apply ASAP gel immediately to reduce inflammation, protect against infections and facilitate rapid wound healing. The Silver Sol liquid can also be sprayed on the affected areas. Cuts, Abrasions, Chafing and Insect Bites — Immediately apply the ASAP gel to reduce inflammation, redness, protect against infections and promote healing. Facial Treatments — apply ASAP gel before and after any treatment that punctures the skin i.e. dermarolling, extractions, chemical peels, microderabrasion, acupuncture, Botox and filler treatments, etc. Peeling and Flaking — treatments such as Retin-A often results in drying, flaking and peeling of the skin. Applying ASAP gel will help to moisturize, heal and reduce the inflammation of the skin. Pimples — apply ASAP gel directly to the pimple or skin eruption 2–4 times a day. You can also spray the Silver Sol liquid on the affected area. Shaving — ASAP gel is also a great after-shave product to eliminate chafing, redness and to heal razor nicks. Silver Sol — Your new best friend for skin health. While Cleopatra might have had an endless supply of sour goat’s milk, the modern woman has many skin rejuvenating options to enhance her natural beauty. The Silver Sol products are now taking their rightful place as a necessary compliment to any skin care program to help reverse, prevent and minimize visible skin aging. The Silver Sol liquid and ASAP gel provide a safe and effective way to protect the skin from all forms of pathogenic infection, heal red, chaffed and inflamed skin and eliminate the risk of scarring. Love your skin. Love your Silver Sol!